Riana Jewellery does handcrafted silver jewellery with Jadtar work and semi-precious beads and stones—all inspired by Indian heritage. 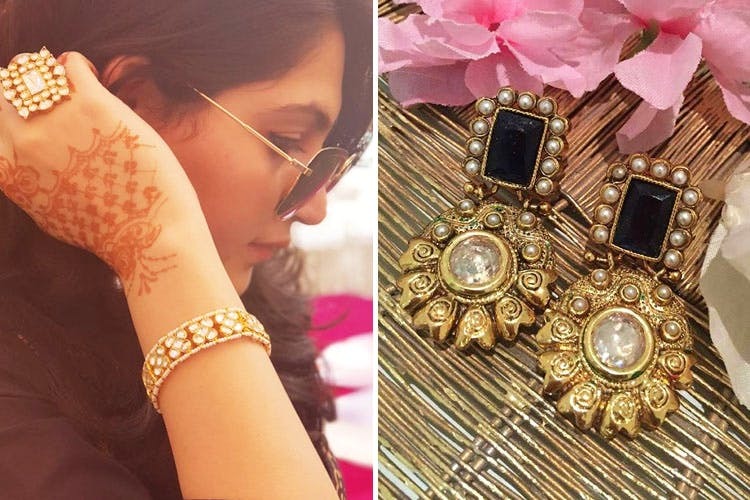 They've got bangles with intricate designs and none of the gaudiness that can come with traditional jewellery, pearl necklaces with beautiful, layered designs and antique looks, artisanal rings with teardrop designs, and bracelets and earrings with traditional designs that have just the right touch of class. You'll also find nose rings, paayals, passa, haathphool, and more. The stuff looks right out a bridal magazine, and if you've got your (or your BFF's) big day coming up, we say you pair your ethnic outfits with the designer jewellery from Riana. All of their jewellery has a silver base and has detailing done with emerald beads, ruby beads, pearls, jadtar stones and more–take your pick! The best part? Their designs start at as low as INR 1,250. If what you've ordered is in stock, you'll get it in 3–4 days, but if something has to be specially made for your order, it can easily take up to 2–3 weeks—so we say you plan in advance. They've got an Oxidised Jewellery section where you'll find fun earrings in shapes like owl, elephant, dolphin and more.